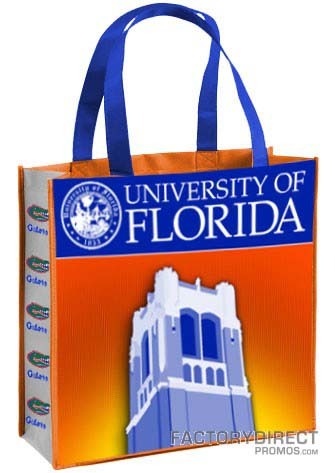 Colleges and Universities, Use Custom Reusable Bags to Make Walking Billboards Our of Your Fans! Custom reusable bags are an effective promotional tool for any brand. Often businesses focus on creating customized bags to hand out a trade shows or other events, but for colleges and universities, custom reusable bags are an effective and fun marketing tool. From students to alumni and staff and even supporters of your program, custom reusable bags can turn your fans into mobile, walking billboards. Keep reading to learn how to put custom reusable bags to work for your school or university. From carrying groceries, school or work items, to workout clothes or whatever you need to tote around, custom reusable bags can do it all. This versatility, usefulness and ability to show school pride, will make your reusable bag a handy item that students, teachers and fans alike will be sure to reach for and use again and again. The quality construction and well-made design means our bags will last for several years. After 20 years in business we know how to manufacture a bag that stands up to the heaviest of loads and will look incredible for 3 or more years. That quality means that over the years, every time one of your supporters carries your custom branded bag, they will spread your message and give your college or university an endorsement. They’re a great tool for getting your organization noticed and will increase your exposure. Reusable bags are only effective if you get them to your supporters. For your custom reusable bags to work, your fans need to carry them and showcase your message like a mobile billboard. Get your bags out there by selling them in your school’s bookstore or spirit stores and at athletic and other events. You may want to utilize a custom reusable bag as a part of a fundraiser or special event. You can even hand out your custom reusable bags at events for free. To promote the event, let everyone know that a limited number of custom bags will be available to the first to arrive. This will create interest and get people excited about the event and your custom branded bags. You can also create a special bag design to give new students at orientation. We can even help you design an interactive, full color bag that includes a map of campus and a QR code! Everyone can find a use for reusable bag and if they’re customized with your school’s colors and information, students and fans alike will be excited to use them all of the time. Our custom reusable bags are made from recycled content. This means existing materials are repurposed and given a new life. Utilizing recycled fabrics reduces your organization’s carbon footprint, and it also sends a message about your stance on environmental issues. Creating a bag with recycled content shows your supporters that you are a part of the solution to decreasing plastic on the planet, you are serious about marketing responsibly and you want to help them live greener too. If you want to learn how to make your very own custom reusable bags, check out our lineup and get in touch for a quote, or let us know if you have any questions. Once you confirm your order we can turnaround your custom bags in 60-90 days; although, we do offer rush options if necessary.